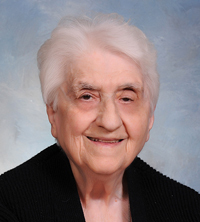 Sister Manetto Ruocchio, O.S.F., died Dec. 18 in Assisi House, Aston. She was 93 and had been a professed member of the Sisters of St. Francis of Philadelphia for 72 years. Born Susan Dorothy Ruocchio in Philadelphia where she was a member of St. Thomas Aquinas Parish, she entered the congregation in 1943 and professed her first vows in 1946. Sister Manetto earned a B.A. in secondary education from Villanova University and an M.A. in English/education from the Catholic University of America. She ministered primarily in elementary education. Sister Manetto’s work in education began in the Diocese of Providence but she ministered for 34 years in the Diocese of Trenton, where she taught at Blessed Sacrament School and Immaculate Conception School, both in Trenton. She served as principal as St. Raphael School and St. Anthony School, and as both teacher and principal at Holy Angels School. She also taught at St. Rose of Lima School in Freehold, N.J.
Additional ministry in education included serving as principal at St. Nicholas School in Egg Harbor, N.J, in the Diocese of Camden and at St. Joseph School in Lancaster, Pa., in the Diocese of Harrisburg. Sister Manetto ministered for 20 years in the Archdiocese of Philadelphia where she served as a volunteer at Neumann University in Aston. In 2003 she moved to Assisi House in Aston where she served in prayer and hospitality ministry until her death. The funeral Mass was celebrated Dec. 21 at Assisi House. Burial was in Our Lady of Angels Cemetery in Aston. Sister Manetto is survived by her sister-in-law, Ann Ruocchio, nephews, and by her Franciscan family.